Antonietta Spizzo and Dario Masarotti are setting off from their home in Italy and heading for Moscow! Veteran Italian Long Riders Antonietta Spizzo and Dario Masarotti left their home in Premariacco on 7th July, with the goal of travelling to Moscow, where they expect to arrive at the end of September. "They left from home on Saturday morning after a very short ceremony and headed straight for their first stop. Apart from the extremely hot day everything else worked out as expected. Everything you want to know about their journey to Russia is on their site (www.equidistanze.it). A friend will be updating it with all the information my aunt sends him. This includes news and their exact position. So that will be worth a look!!" 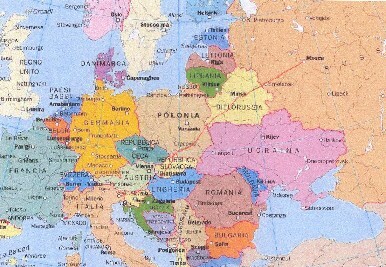 Antonietta and Dario will be riding through Slovenia, Austria, Hungary, Slovakia, Poland, Belarus and Russia. "This week they are travelling across Belarus towards the Russian border. The rest of the journey is approximately 800km long and will end at the beginning of October." To read about Antoinetta and Dario's earlier Long Rides, please click here. Here is a map of all the rides this adventurous couple has made. Click to enlarge. Antoinetta and Dario are safely back at home, and sent this message to The Guild. We are very happy to tell you that on Oct 5th we reached Moscow with our horses Tarim and Terek after a journey of 3000 km! We had left our home in Italy on the 7th of July for a journey that lasted almost 3 months. We wanted to cross as many EU-countries as possible, so we went through Slovenia, Austria, Hungary, Slovakia and Poland, enjoying the great hospitality that characterises these areas. Here there is of course no problem at the borders. The weather was warm and most of times we slept in our tent, while the horses were near us inside our small electric fence; on September 1st we arrived in Belarus (we spent 2 days on the border, because nobody knew what to do with two horses without a car and number plate), there we visited many of the friends that hosted us10 years ago, and met many new ones thanks to the vets that helped us find places to stay overnight. Until the 20th of September the weather was horrible and the journey very hard, but then came the so called "grandmother's summer" and the weather improved a great deal, and in similar way our mood grew better and better. No problem crossing the border with Russia when you come from Belarus, because this last country is the real guardian of the borders with the East. Belarus and Russian people are very friendly and generous, as we already knew, so we got to know a lot of friendly people. We rode very fast and on October the 5th we reached our destination and our goal, a riding centre in the outskirts of Moscow (Odinzovo). For all documents, visa and transit permits (which were very hard to get) we had the help of a Russian cultural Association, which also organised a kind of conference in Moscow on the 12th of October. Unfortunately it was not possible to take the horses in the centre of town, not to speak of Red Square (what you see in the picture is our Photoshop-revenge). 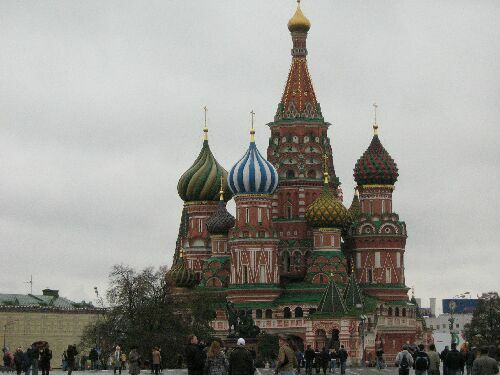 We had enough time to see Moscow but after 3 months in the countryside this super big city disappointed us: traffic is crazy, streams of people everywhere, huge neon signs of Nikon and Samsung and only one god: MONEY. But on the disappointment of travellers when they finally reach their destination have been written mountains of books. Let's speak now of our horses, Terek (Anglo Arab gelding, born in Sardinia, 15 years old) and Tarim (Trakehner gelding, born in Germany, 5 years old). They travelled all the time in best health and conditions, Terek was even a little too fat! We are especially proud of Tarim, the young one, because he has proven to be a really good travel companion. He isn't afraid of anything and behaves very well even in the worst traffic (even better than Terek). He likes the company of human beings and he is very friendly with all other horses as well, (unlike Terek), so it's easier to find a place for him in every stable. At the beginning he was a little afraid of cows, and once he was really scared after seeing an ostrich (a monstrous hen, maybe, in his eyes)! But only now that we are back home with our horses safely in their paddock we can say that our journey has really succeeded: even the way back (by car) was very long, we drove 5 days and had to wait 9 long hours at the Belarus-polish border, in total despite of the laws about animal well-being! Our friend Paolo Sinuello reached us in Moscow with our car plus the horse trailer and together we drove home. On Oct 17th we came back home! Unfortunately all the articles are in Italian, but there are a lot of pictures so I hope you can equally enjoy a little taste of Russia.